A worthy successor to 'Arising Realm'. Great production, the mix is simply perfect! Guitar harmonies have a strong folk vibe and the blend with satanic lyrics is quite interesting. Underrated album and band. It's certainly a shame that a band with such talent as Norway's Ragnarok goes completely under the radar. They bring a fresh, more modern and sophisticated sense to the older style of pure, raw Black Metal. 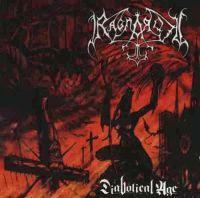 With their album Diabolical Age, Ragnarok take the raw ferocity of early '90's Norwegian Black Metal and work in some sweet melodies and atmospheric touches. Whether it's with keyboards or the guitars, there is always something of interest going on. In a day and age where Black Metal bands are a dime a dozen, it's nice to see one of these relatively unknown bands put out something as good as this. Whether it's with the pummeling intricacy of "Heart Of Satan", the sheer energy of "It's War", or the mesmerizing, breathtaking keyboard harmonies of "Diabolical Age", Ragnarok give me a breath of fresh air in a scene full of look (and sound) alike bands. Certainly worth your time, money, and attention. Full review to come.